The irreverent Western comedy A Million Ways to Die in the West, comes from Family Guy creator Seth MacFarlane, who directs produces, co-writes and stars in the film. 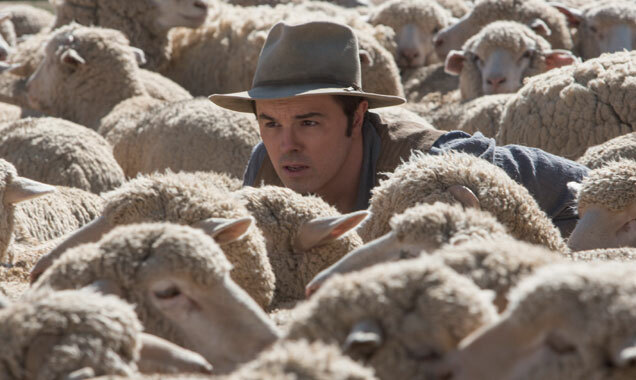 Seth MacFarlane takes wooly cover in A Million Ways to Die in the West. When Albert Stark (Seth MacFarlane) loses his fickle fiancée (Amanda Seyfried, Lovelace) to a mustachioed dandy (Neil Patrick Harris, A Very Harold and Kumar Christmas), he rebounds hard with Anna (Charlize Theron, Young Adult), a gorgeous gunslinger new to his Old West town. What he doesn’t know is that Anna’s ex, Clinch Leatherwood (Liam Neeson, The Grey), is the most dangerous desperado on the horizon and he’s on his way to reclaim his gal—whatever it takes! Also starring in the film are Giovanni Ribisi (Contraband) and Sarah Silverman (Peep World). A never-before-seen unrated of the film featuring 18 additional minutes is available exclusively on Blu-ray and Digital HD (which was released on Sept. 9). Though the flick tanked with the critics (it garnered a 4.9/10 rating at Rotten Tomatoes based on 185 reviews) and didn’t exactly kick as at the domestic box office ($42 million in wide release last spring), it’s sure to rock it on disc! * The Good, The Bad and the Increasingly Decreasing Population – Learn about some of the familiar faces that pop into Old Stump including one of the greatest cameos of them all, a visit from Christopher Lloyd aka Doc Brown.